JamDeck est un outil de composition qui permet d'enregistrement facilement vos idées musicales à la volée et de les superposer à l'aide d'un boucleur 32 temps. 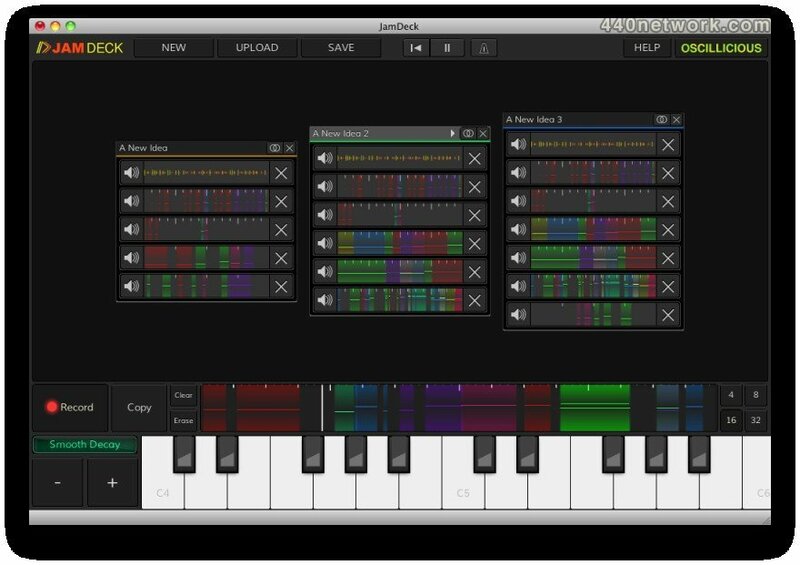 JamDeck est fourni avec 21 instruments intégrés couvrant une large palette de styles. Les mélodies peuvent ensuite être déposées directement dans un logiciel DAW comme fichiers MIDI. 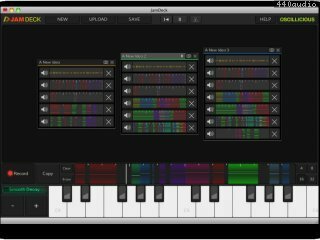 JamDeck inclut aussi Freestyle Recorder, un enregistreur MIDI mains libres qui permet de créer des boucles sans manipulation. OS X 10.6+ (Intel) or greater required. Improved PC/Mac keyboard responsiveness – things are going to feel a little bit snappier when you’re rocking out with your keyboard. Fixed a rare crash while loading SodaSynth presets. Fixed some loop recorder rendering bugs. Introduced a new “jambundle” file format for Mac OS X, plus file associations. A couple other minor packaging fixes for Mac OS X. 1. A realtime mastering bus now automatically applies some dynamic range compression and excitation to enhance the overall sound quality of your jams. In other words, everything just sounds better. 2. There should be improved compatibility with soundcards using the default Windows Vista/7/8 WASAPI audio API. We’ve made adjustments to provide a better out-of-the-box experience on Windows so you hopefully won’t have to mess around in the preferences before your soundcard works. We tested this on a range of hardware, but if you run into any audio issues on Windows with SongStarter, we’d appreciate it if you got in touch so we can fix them for good. Updated help screen now points to our SongStarter help page. External audio input latency has been slightly reduced. Improved compatibility with certain Windows recording devices. Turned it to 11 – the overall volume is louder, should be closer to other applications. Fixed a bug in which loops of certain lengths would get rounded incorrectly in the Freestyle Recorder’s tap tempo screen. Switching drum beats now sets the project tempo to the original tempo of the drum beats. No more chipmunk DNB drums when you’re trying them out. The biggest problem reported so far was that the beta version appeared expired for many Windows users. I’ve done a bit of tinkering and I think I’ve managed to fix this one, so if you couldn’t get SongStarter to run before, try hitting the SongStarter page again and download the new version for Windows (songstarter-1.0-beta-082312-win32.exe). The Mac version has been updated with these fixes too. I quietly fixed the OS X package having some broken artwork and instruments earlier in the week.